↑ "Dhadak: Janhvi Kapoor looks like mother Sridevi in debut film's 3 posters with Ishaan Khattar". Hindustan Times. 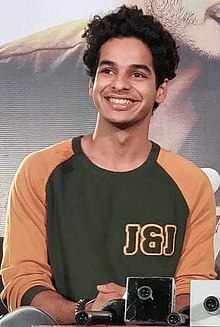 Archived from the original on 15 November 2018. http://www.hindustantimes.com/bollywood/dhadak-karan-johar-shares-poster-for-jhanvi-kapoor-ishaan-khattar-s-bollywood-debut/story-OHmGQl3NNbyyJ0fWUIidoN.html. अन्तिम पहुँच तिथि: 15 November 2017. ↑ "SEE: Karan Johar unveils poster of Janhvi Kapoor's debut film Dhadak opposite Ishaan Khatter". India Today. Archived from the original on 15 November 2017. http://m.indiatoday.in/story/jhanvi-kapoor-debut-ishaan-khatter-dhadak-sairat-remake/1/1090113.html. अन्तिम पहुँच तिथि: 15 November 2017.